FUE hair transplant leaves no scars and it is the only permanent solution for lost hair. Implanted hairs do not fall out in future because the hairs extracted from donor areas are genetically different. 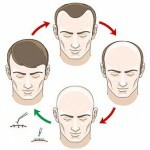 These hair follicles are resistant to DHT enzyme which is the main cause for male pattern hair loss. Our excellent results are internationally recognized by the associations and appreciated by independent reviews. Born in 1965, Hair Surgeon Dr. Tayfun Oguzoglu is performing hair transplant operations in Istanbul since 1996. For his natural looking hairline results, he has been accepted to the International Society of Hair Restoration Surgery (ISHRS)and European Society of Hair Restoration Surgery (ESHRS) in 1998 and still an active respected member since then. He has been also accepted to American Board of Hair Restoration Surgery (ABHRS) in 2014, which makes him the 10th Surgeons in Europe who holds this certificate and the only Surgeon in Europe with all these qualifications altogether. Our clinic is located in the prestigious MediState Hospital in Istanbul. It’s one of the few hospitals in the country with JCI accreditation. Our clinic is periodically inspected by the Turkish Ministry of Health and we hold certificates for the highest level of hygiene. What Clients Think of Us? From the minute I landed in Istanbul I was treated very well, the hospital being very modern and of impeccable cleanliness. My operation went better than I could ever have imagined and I’m over the moon with my new hairline and the results are fantastic. GetHair are true professionals at their job and my experience with them was beyond my expectations. The clinic is a state of art and top standard. I can’t thank GetHair enough.